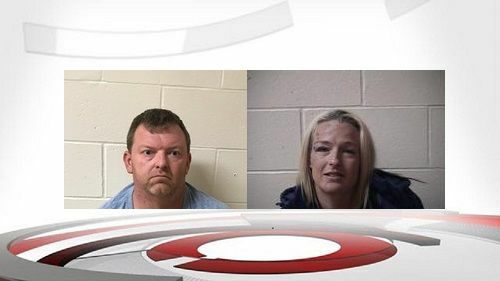 LOUISVILLE, Ky. (WDRB) -- Two people were arrested after a string of car crashes in southern Indiana left several people hurt. Indiana State Police say that on Friday around noon, calls were received reporting that a white Mitsubishi was "driving erratically" along I-65 north near Scottsburg. Police say just after 12 p.m., the Mitsubishi crashed into a guardrail on I-65 north, near the 34.5 mile marker. The car then crossed back over both lanes and crashed into the median guard rail, before coming to a rest. The car's driver, 37-year-old Lindsay Bostock, of Sellersburg, Indiana was arrested for operating while intoxicated. Bostock was taken to the Scott County Jail. Authorities say prescription opioids are suspected to be a factor in the crash. Officials say traffic became backed up because of the first crash. A "three-vehicle property damage crash" then happened on I-65 north at the 32.7 mile marker at around 12:50 p.m. Then just after 1 p.m., a six-vehicle injury crash happened one mile south on I-65 at the 31 mile marker. Police say traffic was at a standstill because of the second crash scene. 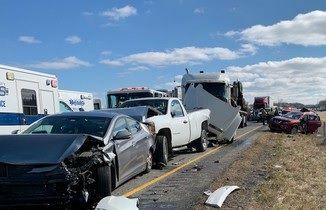 A 2003 International tractor-trailer crashed into the back of a line of stopped cars, which caused a chain reaction of rear-end crashes that involved five more vehicles. Police say the driver of the tractor-trailer, 46-year-old David Ray Wisdom, of Lawrenceburg, Tennessee, was found to be in possession of meth and drug paraphernalia. He was arrested and also taken to the Scott County Jail on charges of meth possession, possession of drug paraphernalia and maintaining a common nuisance. The case remains under investigation, and toxicology results are pending for both Bostock and Wisdom.